The Torres family, Spain's leading wine dynasty, is busy exploring every up-and-coming region in their country. Yet they still get together for Sunday suppers at home in Catalonia. Writer Patrick Matthews drops by for lamb chops and Cabernet. The debut of a new wine is a tense moment, especially when the people tasting it have names like Rothschild, Antinori and Drouhin. But the Torres family, Spain's leading wine dynasty, has always taken risks. On a hot day this past summer, members of those wine families and others—33 guests in all—gathered under a tent at one of the Torres family's Priorato estates, in northeastern Spain. While enjoying a breathtaking view of the property's terraced vineyards, they sipped samples of inky, intense Clos Bellaterra. The wine probably won't be on the market until 2007, but that the Torres family was willing to preview an experimental blend says a great deal about their confidence in it—and the reaction from their guests suggested the confidence was justified. Until the Torreses bought land in Priorato in 1995, this empty lunar landscape of arid hills was scattered with a few tiny, steep vineyards, many of them no larger than an acre or two. But the Torres family saw the land's potential in wines like Alvaro Palacios's cult bottlings L'Ermita and Finca Dofí and moved aggressively, purchasing 270 acres of the region's scant 4,000. Their involvement confirmed Priorato's status. After they bought in, land prices soared. Those Priorato holdings became part of a remarkable portfolio of Spanish and international wineries. The Torres family makes world-class single-vineyard reds from several estates in Spain's Penedès and Conca de Barberá regions, notably the Mas La Plana Cabernet Sauvignon and Grans Muralles, a high-end blend of ancient Catalan varieties; they also produce terrific everyday Spanish reds and whites, such as Sangre de Toro and Viña Sol. They are pursuing new projects in almost every up-and-coming wine region of Spain, notably Toro in the west and Jumilla in the southeast. In Chile, they create wines with a characteristically Spanish feel: The new Conde de Superunda is part Tempranillo (the main variety of Rioja). And in the United States, current president Miguel Torres's sister Marimar has her own Sonoma, California, winery, which produces Pinot Noir and Chardonnay. Torres's sales totaled about $200 million in 2004. That's not enough, according to Miguel, especially when the wine world is dominated by multinational companies more than 10 times this size. Miguel is thoughtful and soft-spoken and yet no less a pioneer than his somewhat dictatorial father, Miguel Torres Carbó, had been. "My father was a man of great character," says Miguel. "A man with a vision: He wanted to have his wines recognized." Torres Carbó's personality was shaped, according to his son, by the horrors of the Spanish civil war. In the late 1930s, local anarchists seized the Penedès winery and placed it under workers' control. Torres Carbó, threatened with arrest and execution, fled to Barcelona. Then in 1939, Luftwaffe pilots, allied to Francisco Franco's nationalists, bombed the railway station of Vilafranca del Penedès, destroying the Torres winery in the process. Soon after, Torres Carbó, who was working for the Republican army as a pharmacist, was threatened with arrest and internment in a concentration camp. "He was rescued by a cousin in Franco's army," Miguel says. "It was a very difficult time." After the war, in the early 1940s, Torres Carbó rebuilt the winery as rapidly as he could. The company's fortunes turned, partly on the strength of two wines: Sangre de Toro ("bull's blood"), a juicy blend of two important Catalan red grape varieties, Garnacha and Cariñena; and Viña Sol, made from the white Catalan grape Parellada. Miguel also recalls coming up with the brilliant marketing gimmick of dangling a little plastic bull from the neck of each bottle of Sangre de Toro: "In China and Japan today, people don't ask for Torres. They say 'Give me the wine with the bull.'" Miguel had mixed success getting his father to agree to some of his ideas. One decision in particular set the two men at odds: building a new high-tech winery in the village of Pacs, two miles outside Vilafranca del Penedès, where the firm had built a new estate, Mas La Plana, now the family home. Since he knew the old man would never agree, Miguel resorted to stealth. "He was strongly resisting it, so I did it step by step. I started with 10 or 20 stainless steel fermenters, and said there'd be no more. Then the next year I tried to get 20 more. So we did it little by little." When it comes to his own children, Miguel has succeeded in avoiding the clash of generations that he experienced with his father, yet he manages to get his way. For instance, his daughter Mireia, 36, initially trained to be a chemical engineer. "I didn't want to work in the winery," she says. "But when I finished my degree, my father asked me to study at the University of Montpellier, one of France's top wine schools; after that, of course, my life changed." Now she's Torres's technical director and creator of the new Nerola label, making stylistically modern, fruity wines with a blend of traditional grape varieties sourced from across Catalonia. Her brother, Miguel Jr., 31, is a huge fan of Nerola. "It's fresh, it's young, it's a new generation—it's Mireia's own personality," he says. Torres's general manager for the Jean Leon brand and the company's marketing manager for Spain, Miguel Jr. came to the company with experience outside of the wine world—his was in the perfume industry. He has inherited mild blue eyes from his father and fair hair from his German-born mother, Waltraud. "Our dad was smart," he says. "It wasn't 'After university you have to go into the family business,' but every Sunday we had to make an excursion to a vineyard. We never went to Disneyland—we were very mad at him about that—but always ended up in a vineyard. So by the time I was 16, wine was a part of my life. Definitely my father was better with us than my grandfather was with him." 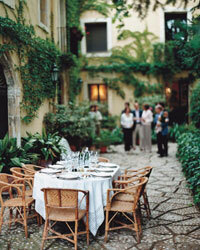 As evidence of their unity, the Torreses get together each Sunday for a meal in the tree-shaded courtyard at Mas La Plana. Everyone brings a wine made by friends or rivals. On a recent summer weekend they tasted table wines made by their friends the Symingtons, of the port dynasty, then paired Torres wines like Fransola (a refined single-vineyard Sauvignon Blanc) and their award-winning Mas La Plana with Catalan-style dishes: rap al all cremat, silky monkfish in a tomato sauce sprinkled with paprika and crispy shards of garlic, and costelles de xai samfaina, pink lamb chops paired with a hearty sauté of eggplant and bell pepper with herbs and smoky ham. As close as the family is, it's not surprising that Miguel had to coax his offspring into the business. A famous name can be a hindrance as well as a blessing—something Miguel Jr. reflects on whenever he checks into a hotel room and finds that the bed has been tilted up, an arrangement his father always requests. But even when there's been a slight confusion over which Miguel is which, there's no doubt that he's a Torres. London-based Patrick Matthews's most recent book is Burgundy: How to Find Great Wines Off the Beaten Track.